The New ‘King of the Road’? 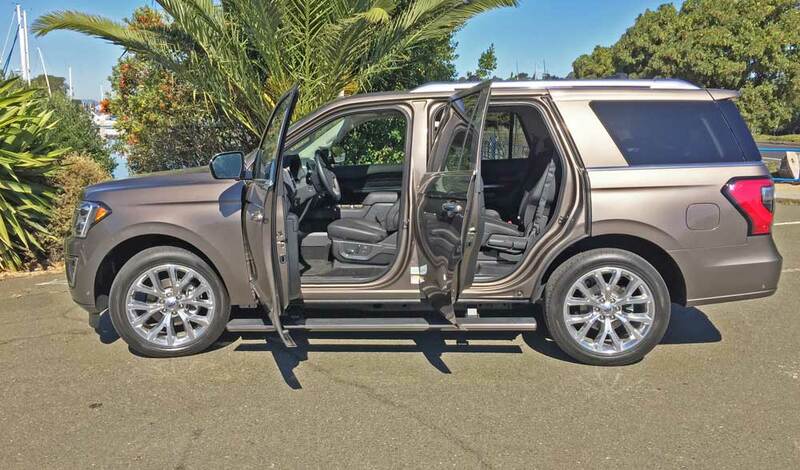 The Ford Expedition is a three-row mega-sized people mover with seating for up to eight. 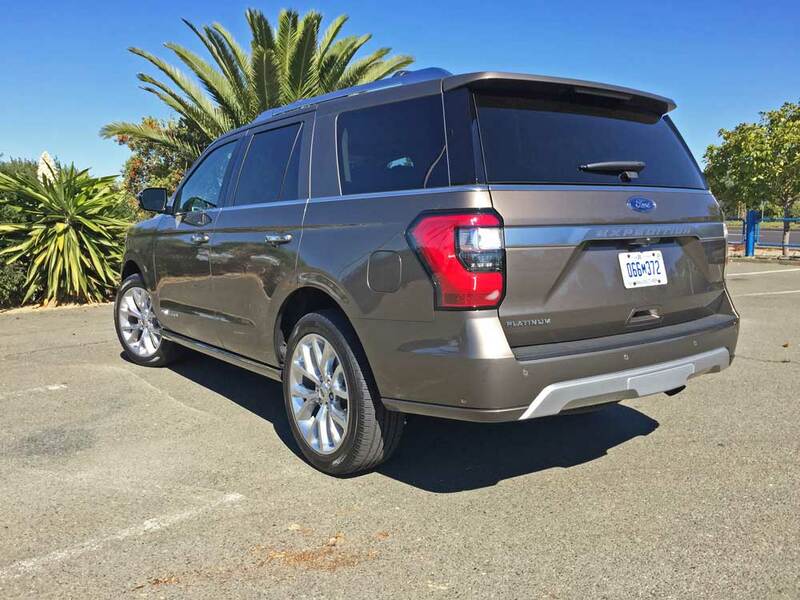 There are two sizes – the Ford Expedition and the Ford Expedition Max, whose wheelbase is extended 9.1-inches, with an increase in overall length of 11.9-inches. 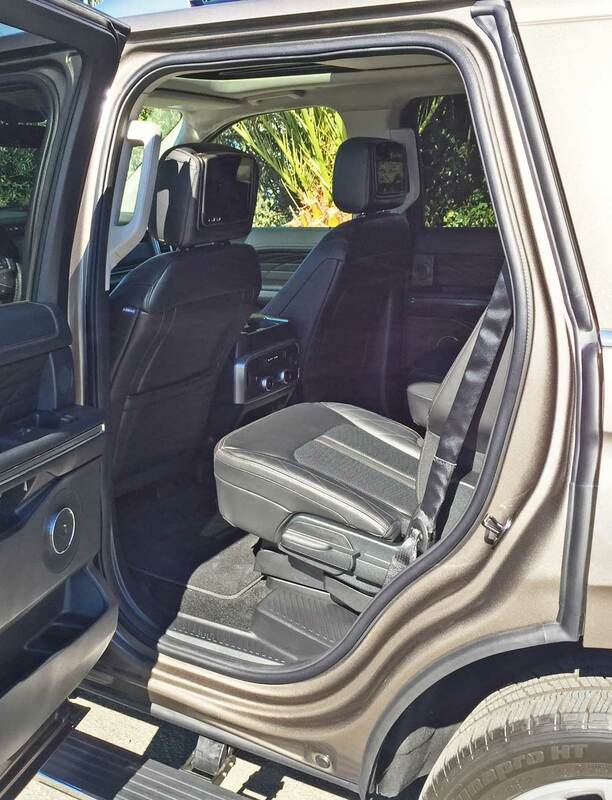 We’ll deal here with the regular Expedition, which is available in four levels of trim: XL; XLT, Limited and Platinum, with an Expedition Special Edition Package available for 2019. The Expedition for 2019 is essentially a carryover in terms of styling and mechanical features, which was all-new for 2018. 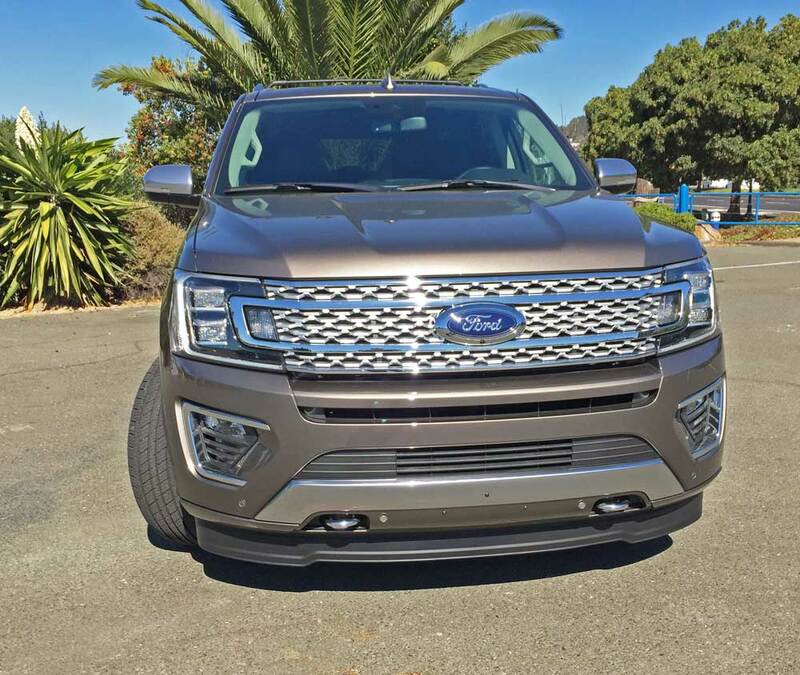 The only changes for 2019 models other than the Special Edition Package include: available unique seating, material for XLT models; Dual-zone electronic temperature control becomes Tri-zone control; bright roof rails and bright end caps become standard for Platinum models; and available FordPass™ Connect replaces SYNC® Connect on all trim levels. All other content, including the advanced cargo management system and the powertrain remains unchanged for both standard and extended wheelbase MAX models. 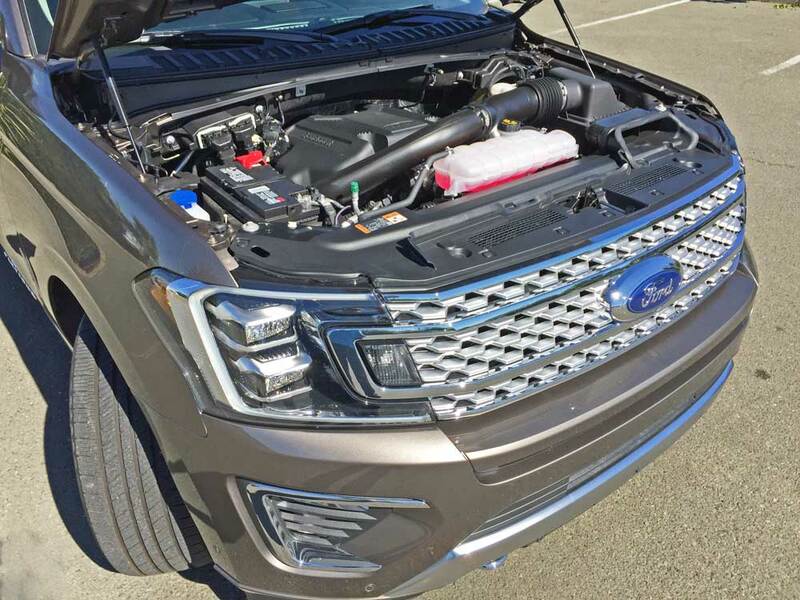 Power continues to be provided by Ford’s 3.5-liter EcoBoost Twin-turbo V6 engine with auto stop/start, longitudinally mounted forward. The horsepower is 375 at 5,000 rpm and the pound feet of torque measures 470 at 3,500 rpm. Energy reaches the driving wheels (either rear or all four) via a ten-speed SelectShift automatic transmission. 4×4 models feature a two-speed automatic 4WD with Neutral Towing Capability and a 9,300 pound towing capacity. Steering is electronically power-assisted rack-and-pinion, and the rear axle is a non-limited-slip 3.31. While the exterior styling is the same for both 2018 and 2019 models, it is still attractive in an immense, boxy sort of way. There is a noticeable resemblance to the frontal styling of the Range Rover, which is not a bad thing at all. The new Expeditions are both larger and lighter than their predecessors thanks to their aluminum intensive construction. 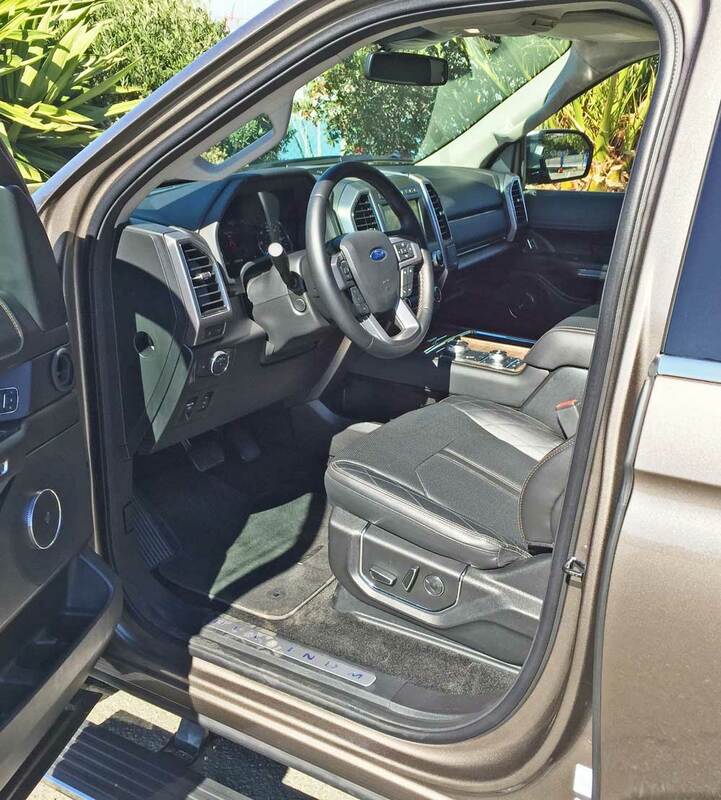 The interior is spacious and then some, with bucket seats up front with recline and a 6-way power driver’s seat featuring power lumbar support. The second row seating is in a 40/20/40 split with CenterSlide® and the third row seat is a PowerFold® bench. There’s plenty of uncrowded room for passengers and their gear. 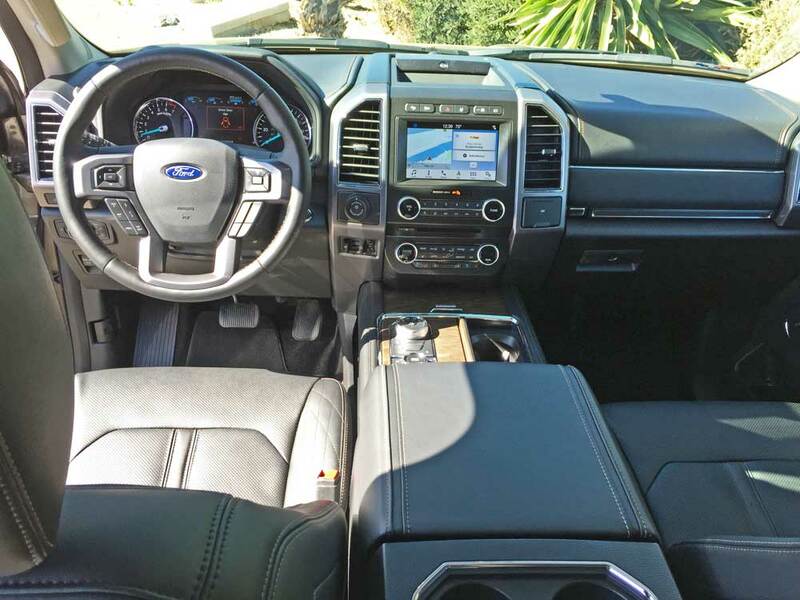 The latest Ford Expeditions are loaded to the hilt with state-of-the-art technological features that cover Infotainment, connectivity that comes with an 8.0-inch Sync 3 touchscreen with Apple CarPlay, Android Auto, and a 4G LTE mobile hotspot, driver assistance and safety categories. 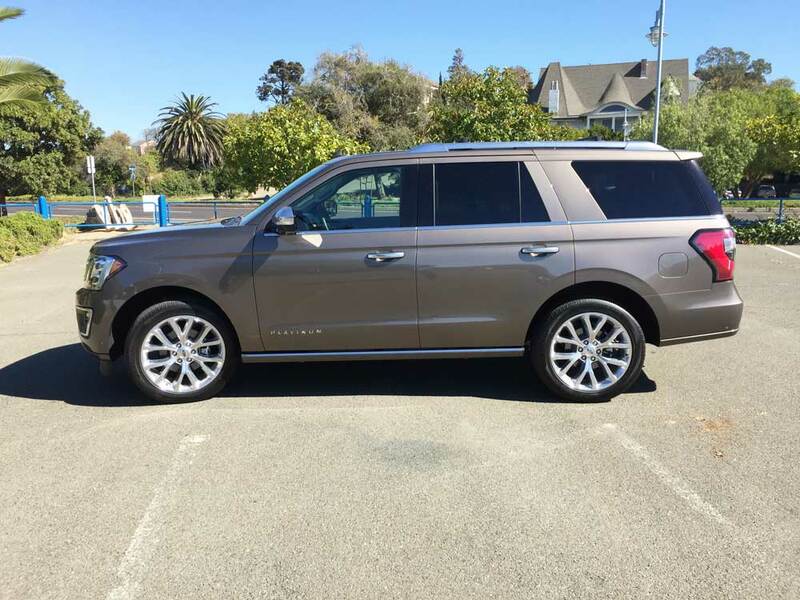 My test Ford Expedition was in Platinum trim and a 4×4 configuration. The exterior was sprayed Stone Gray metallic and the interior was executed in Ebony leather. The base price was set at $76,175., which bumped up to a final total of $81,815. 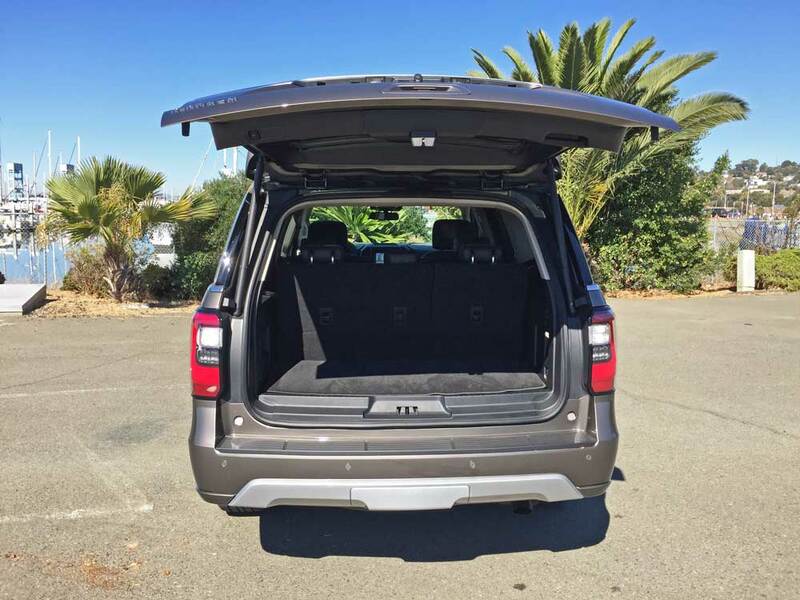 After factoring in the $4,375 worth of options which included: the second row leather seating, heavy-duty trailer tow package, reversible cargo mat, rear seat entertainment system and the Destination and Delivery charge. 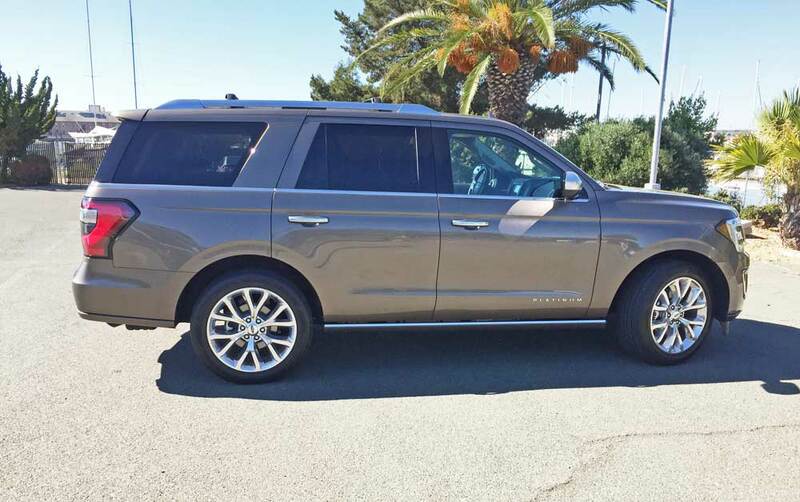 The ride quality of the Expedition is quite comfortable and the styling is pleasing as far as Luxo SUVs go, and the handling characteristics are on the heavy side, but keep in mind that this is no sports sedan. The top trim levels fall into the lofty price category, comparable to or even in some cases exceeding premium luxury European brands, while lacking the same quality of materials and detailed attention to final fit and finish. 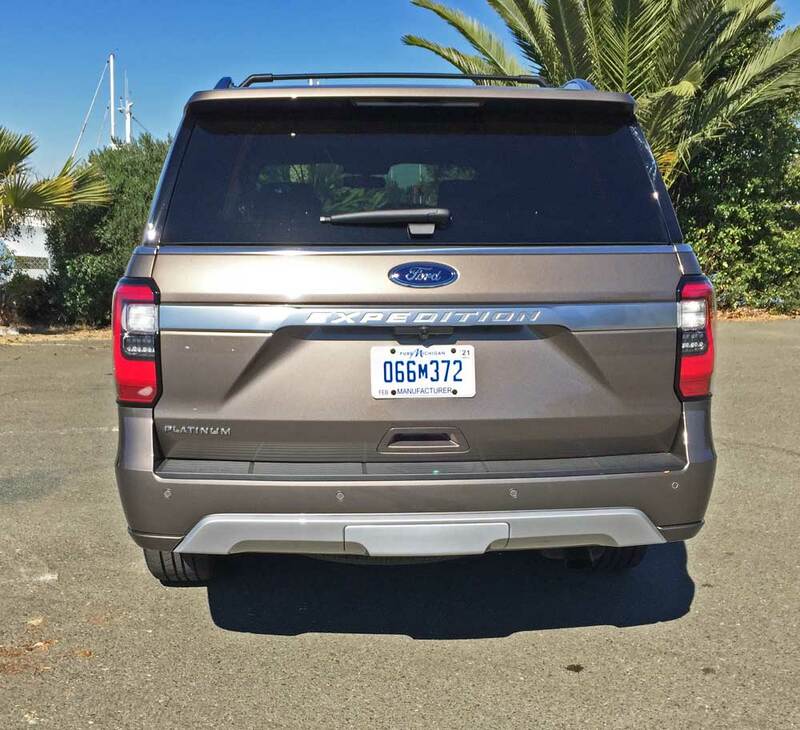 In the final scheme of things, the new 2018 or 2019 Ford Expeditions is a fine SUV with ample power for rapid acceleration, especially considering its overall mass. Does it achieve the American made full size SUV “King of the Road” status that it aspires to? The answer will be no for some, while Blue Oval fans will likely respond with a resounding yes. In any case, the Expedition generally falls in between GM’s top-of-the-line examples and it’s sistership in terms of quality execution, content and value. Drive Train: Longitudinally-mounted front engine / Two-speed Automatic 4WD (4×4 only) with Neutral Towing Capability and 9,300 lb tow capacity. Front -Independent double-wishbone, short-and long arm (SLA) design with coil over shocks and 36mm stabilizer bar. Rear – Independent multilink design with coil-over shocks and 19mm stabilizer bar. Brakes: Vacuum Power-assisted four-wheel discs (vented front) with standard 4-sensor, 4-channel ABS and AdvanceTrac® Traction Control with Roll Stability Control, ESC, EBD, Hill Start Assist and Hill Descent Control. 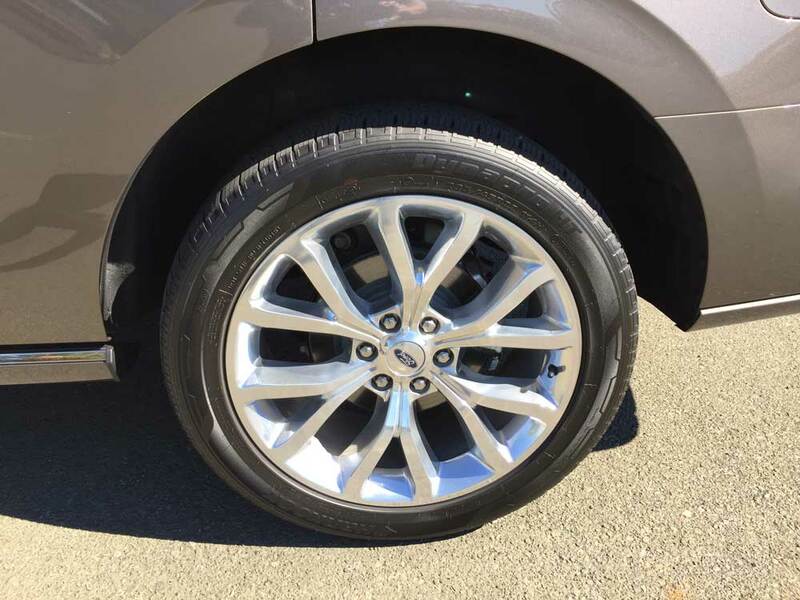 Tires: Hankook DynaPro HP 285/45 R22 114H mounted on 6-“Y”-spoke polished alloy wheels.